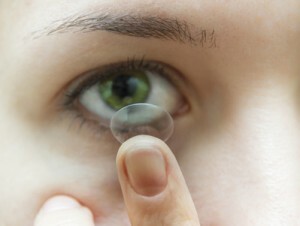 A contact lens is simply a thin lens which sits directly on the eye surface. Instead of wearing a pair of glasses to correct poor vision, a person may decide to wear contact lenses to do the same thing but with no visible optical correction visible to the outside world. Many wear contact lenses instead of glasses, but there are also many who wear contact lenses occasionally as and when needed in preference to their glasses. This may be for sports, or for that special occasion such as a wedding. 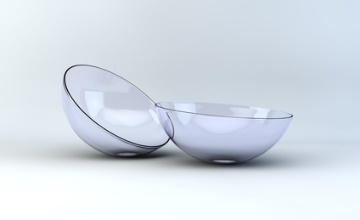 Cost has come down greatly over the years so making contact lens wear a reality for most people. If you have ever considered trying contact lenses then unless you book an appointment with us, you will never know what you are missing! TOTAL EYECARE offers everything from daily-wear contact lenses, to monthly-wear, to extended-wear lenses. Imagine waking up in the middle of the night and being able to see instantly instead of fiddling around feeling for your glasses in the dark. Extended-wear contact lenses can be worn CONTINUOUSLY for a month before being replaced. Why not book an appointment and try them? Aftercare visits are charged at £25. Even if you decide full time wear is not for you, then why not purchase some daily-wear lenses for those special occasions that frequently arise in our lives? Just Contact Total Eyecare and we can book you in for a trial. PLEASE NOTE: IF YOU ATTEND FOR A CONTACT LENS CHECK WEARING LENSES NOT FROM US, A £30 AFTERCARE CHARGE APPLIES.